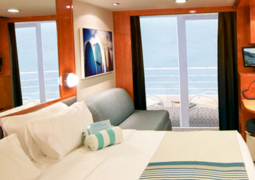 Cruise from Hawaii all year round onboard Norwegian Cruise Line's Pride of America. 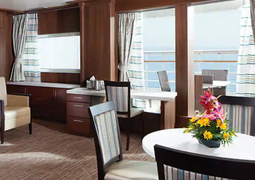 With balconies in over half of the staterooms, experience the spectacular ocean views as soon as you wake up in the morning. If you’re availing of the Feel Free at Sea offer, discover an amazing selection of speciality restaurants taking inspiration from all over the world. Witness twirling knives at the Japanese Habachi restaurant and taste signature French dishes at Jefferson’s Bistro. When it comes to relaxation and “me time”, Pride of America does it right. Spend some time doing nothing at all in the Conservatory or treat yourself to an afternoon of pampering at the spa. Spend a day under the sun with the family at the Miami style South Beach Pool and maybe enjoy a drink at the ocean drive bar. In the evenings attend a show at the Hollywood theatre and enjoy some world-class entertainment. 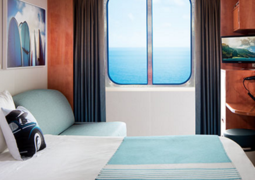 The Pride of America has a range of cabins on board that are sure to satisfy all passengers, from the studios which are perfect for solo travellers to the family cabins which accommodate families in comfort. Cabins are furnished with a range of modern amenities like flat-screen televisions and finished in cherry wood which gives them a welcoming feel. 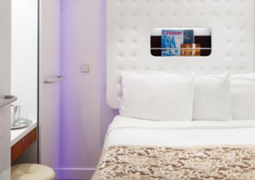 In the suites on board you will find an unrivalled level of luxury and comfort, with spacious rooms filled with extras like a living area, expansive private balcony and a hot tub. You will definitely find the perfect place to experience an unforgettable cruise on board the Pride of America. With a wide range of culinary options, you will be sure to find a place to dine on the Pride of America that will satisfy your tastebuds. The two main dining rooms offer you a place to enjoy a varying selection of delicious and carefully prepared dishes, with Chef's Signature Dishes and carefully selected wine recommendations offering a unique and enjoyable dining experience. A number of other restaurants such as the Asian fusion 'East Meets West' and the open-air 'Key West Bar & Grill' give you more choice when deciding what to eat. When the sun goes down you will find a number of spots to enjoy a drink, from the theatrical 'Mardi Gras Cabaret Lounge & Nightclub' to the tropical and chilled out 'Waikiki Bar'. There will never be a dull moment on board the Pride of America, with such a variety of different events like classes, shows, concerts and more to eep you entertained. The Hollywood Theater is the main theatre on board and where you will find comedy variety shows, magician performances and a number of musical shows sure to be enjoyed by all. The theatre also hosts movie screenings during the day so you can watch a film or two. Different events like quizzes, ping-pong tournaments, arts and crafts classes and culinary demonstrations will be held throughout the cruise so you will never be longing for something to do. The Pride of America has a variety of activities for you. Both large groups as well as small are catered for. The large pool area on board invites all guests to relax and have fun. But even for those who prefer something quieter the Oasis pool area at the stern of the ship may be more suitable. The entertainment of the little ones during the day is also provided. In Rascals Kid's Club the children can enjoy the play area, swimming pool, computer, movie room or jungle area. There are also joint family activities available on the Pride of America to spend some quality time together. Take a walk on Newbury Street and do some shopping in the variety of shops. A wide range of fashion and accessories await you. The Pride of America is the only ship in the fleet of Norwegian Cruise Line that operates under the flag of the Bahamas but under the US American flag. This has the decisive advantage of being able to anchor freely in its target area, namely the Hawaiian Islands. It is used throughout the year. The 940-strong crew also consists of one hundred percent of American citizens. The ship is one of the smaller ones of the fleet. With a length of 280 meters, a width of 32 meters and a draft of eight meters, it can accommodate up to 2138 passengers on board with double occupancy. These can choose between four different cab types; Suites, balcony cabins, outer cabins and interior cabins. The Deluxe Owner’s Suite, with its nearly 129 square meters, offers the most space and luxury. It can be occupied by a maximum of two passengers. Public spaces include various options in the area of ​​dining, bars and lounges, and spa, sports and entertainment. At the Pride of America you will never get bored. The latter category offers you 24 different possibilities of leisure activities. They range from children’s activities to sports facilities to cinema and a library. The nine bars and lounges also offer partial entertainment, such as cabaret. In addition, 14 restaurants are located on the Pride. There is something for everyone, whether Italian or Japanese. In two facilities you will be provided 24 hours a day. As already mentioned, the Pride of America operates exclusively around the Hawaiian islands. The route covers seven days and begins and ends in Honolulu, the capital of the 50th state of America. From here we continue to Maui, the second largest island in the archipelago. On day four, Hilo, the third-largest city on the island group, is driven. Kailua is another city on the largest island called Hawaii and is explored on the fifth day. The last two days will be spent on the Kaua’i Island, before returning to Honolulu by night.